The Emancipation Proclamation was on this date in 1862, and the Great Smyrna Fire was finally extinguished after nine days in 1922. No, different Smyrna. 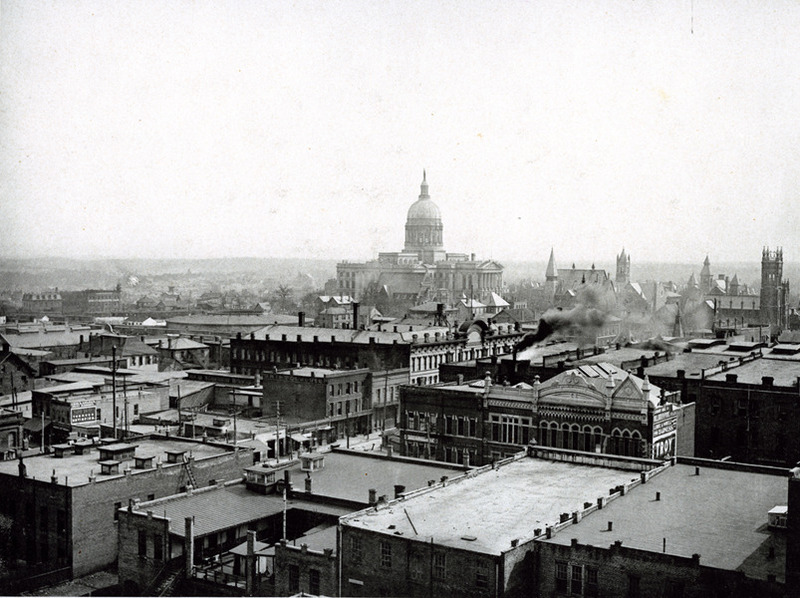 The above is a photograph of Downtown Atlanta shot in 1895 from the Equitable Building’s roof. No, different Equitable Building. I will give Hillary credit for taking the issue on, which must be dealt with soon. Can we not just simplify the solutions? Why not just use VA drug pricing deal for Medicare, Medicaid, Obamacare and government workers? It would save tax payers and consumers a lot of money, while creating more access to needed medicine. Why not just allow consumers to buy medicine in the open market like any other product? Would this not let the free market push pricing down? •	Deny tax breaks for consumer advertising and demand that drug companies instead invest U.S. taxpayer dollars in research and development. Many companies benefit from corporate write-offs for advertising aimed specifically at consumers. Companies that receive federal funds would be required to reinvest a certain amount in research. •	Encourage the production of generic drugs including lowering the amount of time companies can exclusively produce new treatments. •	Cap what insurers can charge consumers with chronic or serious health conditions in out-of-pocket costs. Health insurance plans would place a monthly limit of $250 on out-of-pocket costs for such patients. •	Allow Americans to import drugs from abroad. Countries in Europe with similar safety standards often pay half of what American pay for the same drugs, according to the campaign. Pharmaceutical drug pricing and regulation is something I’ve been working on since my days as a law student. I’m hoping that this pricing scandal will be the impetus for discussion within both parties and, ultimately, some action on the issue. I do want to point out that, while HRC appears to be the first one out with a formal plan, Bernie Sanders has long been the leading voice in Congress for reform. I’d expect to see something from him in the coming days as well. You would not need new regulations if you just allowed VA pricing to be used in combination with import restrictions on medicine lifted. Sanders has a bill out right now that would authorize the VA to import a generic version of sofosbuvir, the Hepatitis C drug that is been amazingly successful at treating, and curing, HCV. Basically, the VA would use import the generics and pay a “reasonable royalty” to the patent holder. There’s still a huge question as to whether or not this is Constitutional. Even if it is, there’s a whole web of import/export laws, FDA regulations, and patent laws that need to be sorted out as well. But, even the threat of issuing a compulsory license on a drug may be enough to get (and keep) the price down. Thank you for valid points on the absolute sham and egregious practice of elevating a previously classified generic drug into the Specialty Tier (ST) status by raising its’ price dramatically. This new cost places the drug into a health plans ST status, which means that YOU pay 25-30% of the cost. Typically, patients are confronted with $600-900 in additional monthly costs, on top of being sick. Unless you are diagnosed with a chronic, long term illness such as, MS, Lupus, Aids, Rheumatoid Arthritis, etc, you will never know about this sad fact lurking in YOUR health plan. Those diagnosed learn they have no safety net; going broke and declaring medical bankruptcy or charity may keep you off the street. Those are essentially the options thousands of Americans face – After they face being diagnosed with a terrible disease. It is a travesty. Lives are broken, then there is death. This could be you, your Mom, your Aunt, or lover – Disease is utterly apolitical. There are many, many solid advocacy sources, so if this issue resonates in your conscience, I urge you to learn more and advocate your representatives. Sometimes we just have to get over the politics and be Americans once again. Drew, anecdotal evidence to be sure, but I use insulin. A 30 day supply for me in the states, without insurance in $420.00. I fly to Mexico City or Bogota with an ice chest and buy the same five injectable pens and it’s $90 a month. I buy a years worth at a time. Into the crisper it goes. And there is no generic insulin yet. Why? Companies make so much damn money, ain’t no way that stuff is going generic any time soon. And with half of America, it seems, being diagnosed with Type 2, it’s the cashest of cash cows. You should have the right to just buy it on the internet, in my opinion. You pointed out a classic example of how the massive amounts of regulations are stopping people from getting medicine they need. Why should you have to fly to MC or Bogota to find affordable medicine, it is just wrong! God Bless You! It’s obviously a broken system. And these aren’t just anecdotes. Medical and pharmaceutical “tourism” is big business in Mexico. Just walk across the border in Tijuana today–the (in)famous Avenue of Americas I remember from the “good ol days” is now chock full of doctors, dentists, orthodontists, dialysis clinics, surgeons, pharmacies, etc.–all serving Americans crossing over from SoCal. Turns out that a broken medical system on the other side of the border is better for tourism than donkey shows and tequila. I have a friend of mine getting surgery on his teeth in Costa Rica. He will save thousands of dollars flying their twice, rather than using insurance here to get it done. You are right the system is screwed up….This has been going on for years before Obamacare…. More than one third of all healthcare expenses in America are administrative costs–mainly due to the insurance industry (both on the patient side and the doctor/malpractice side). Mexico doesn’t have that. And Mexico has a freer pharmaceutical/device market with less restrictions. It also has quality doctors and medical schools. USA Today ran a story last year about how even though many more Californians now have medical insurance because of Obamacare, they still go to Tijuana to get treated because the doctors and overall healthcare experiences are simply better there. Mexico also exports more cars than we do. Not that the two are in any way related. Just a fun fact. So, when Donald strongarms Mexico into paying for that wall, how are we gonna go get our teeth fixed? I would bet you are a very good dentist. The problem is people can only afford so much….Obviously we have a very dysfunctional system that needs attention now! That was his clarification. As with anything he says, it is a bit vague as to details. He certainly implies, at the very least, that he thinks it violates the Constitution of the US to have a Muslim as President. Roger that. But I’d be willing to bet that the vast majority of Americans agree with his sentiment that Sharia Law, with it’s horrid treatment of women as common chattel, is not consistant, in any manner with our Old English Common Law system. Hell, his numbers should rise on that one and to hell with the CAIR spokesman saying he should get out of the race. I’m sure the vast majority of Americans also agree that Klingon Law, with its ritualistic suicide and male dominance, is not constant, in any manner with our Old English Common Law system, either. Talking about Sharia (or Klingon) law and the possibility of it usurping our Constitution is a distraction taking us away from real issues that actually affect Americans. Based on what I saw at last week’s debate, it doesn’t look like the GOP candidates are all that interested in talking about real issues.